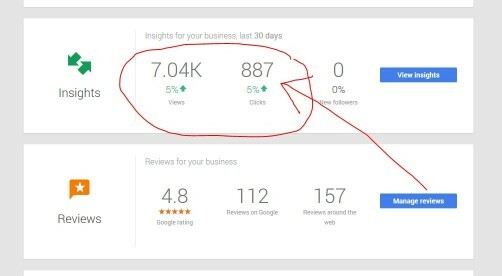 So the other day I was looking at my Google Plus Business Page for my jewelry store Andrews Jewelers and I discovered an amazing statistic…..147,000 people have viewed my Google Plus Business Page! That’s right 147,000 page views. I became immediately frightened by a terrible fact, I haven’t updated my Business Page in 2 years. Shame on me. I guess I spend so much time helping other jewelers market their business that I forgot to market my own, the shoe maker’s kids have no shoes I suppose. Lets drill down in to the numbers a little bit. In the last 30 days 7,000 people viewed my Business Page and 887 people went to my website. Think about that fact, 7000 potential customers went to my Business Page and saw no posts, no videos, no product updates, and no events! I’m going to assume that most jewelers are probably in the same position. What these facts reveal is that your Google Business Page is a wonderful conduit to your business, and probably more important than a Twitter Page, Linkedin Page, and Facebook Fan Page combined. Activity on your page represents life, it means you’re alive & well and ready to engage with your customers. It shows that you’re a thriving business and have positive things to talk about, to sell, and to show them. Zero activity may show that you either don’t care or have nothing to talk about. In any regard, I think it’s a pretty fair assumption that most people will see and view your Business Page before your website or before your Facebook Fan Page. Why? Because Google owns 67.6% of the search market and because Google wants their searchers to see your Google Plus Business Page, not your Facebook Fan Page. In a nutshell, because Google wants it that way. We know what Google wants Google gets. Claim your Google Plus Business Listing – Do this by searching for your business, viewing your Business Page and clicking “Manage Page”. Change Your Profile Image – Go in to the setting section of your profile page and update the profile image. Change Your Background Image – Go to the settings section of your profile page and upload a new image that matches your logo scheme. Post Something New – Create a post that is relevant to what’s going on in your jewelry store today. There’s so much more that can be done including managing your reviews, claiming your vanity URL, turning on features, uploading code to your website, and welcoming followers. For now start with the above checklist and you’re on your way. My next couple of blog posts will expand on how to really squeeze the most out of Google Plus Business Page. If you have any questions please post them in the comments section of this post. In the meantime you can view the changes that I made to the Andrews Jewelers Business Page here.